There is a great deal of relevant existing work, some very closely related. ISO 8601 [ iso8601 ] provides a basis for encoding time position and extent in a character string, using the most common modern calendar-clock system. Datatypes in XML Schema [ xmlschema11-2 ] use a subset of the ISO 8601 format in order to pack multi-element values into a compact literal. Functions and operators on durations, and on dates and times, encoded in these ways are available in XPath and XQuery [ xpath-functions-31 ]. XSLT [ xslt20 ] also provides formatting functions for times and dates, with explicit support for the specified language, calendar and country. Some of the XML Schema datatypes are built-in to OWL2 [ owl2-quick-reference ], so the XPath and XQuery functions may be used on basic OWL data. A first-order logic axiomatization of the core of this ontology is available in [ hp-04 ]. This document presents the OWL encodings of the ontology, with some additions. This version of OWL-Time was developed in the Spatial Data on the Web Working Group (a joint activity involving W3C and the Open Geospatial Consortium). The ontology is based on the draft by Hobbs and Pan [ owl-time-20060927 ], incorporating modifications proposed by Cox [ co-15 ] to support more general temporal positions, along with other minor improvements. The substantial changes are listed in the change-log. The specification document has been completely re-written. Classes and properties from the Time Ontology are denoted in this specification using Compact URIs [ curie ]. Where class descriptions include local restrictions on properties, these are described using the OWL 2 Manchester Syntax [ owl2-manchester-syntax ]. Examples and other code fragments are serialized using RDF 1.1 Turtle notation [ turtle ]. The basic structure of the ontology is based on an algebra of binary relations on intervals (e.g., meets, overlaps, during) developed by Allen [ al-84 ], [ af-97 ] for representing qualitative temporal information, and to address the problem of reasoning about such information. Figure 1 Core model of temporal entities. Figure 2 Thirteen elementary possible relations between time periods [ af-97 ]. 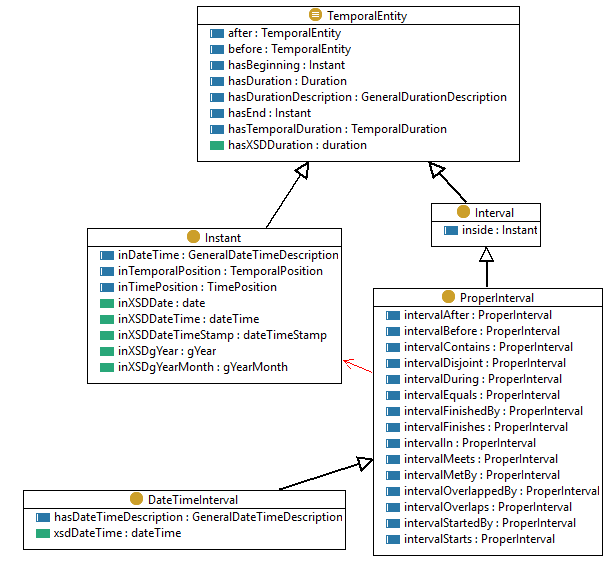 The duration of a TemporalEntity may be given using the datatype xsd:duration and the position of an Instant may be given using the datatype xsd:dateTimeStamp, which is built in to OWL 2 [ owl2-syntax ]. These both use the conventional notions of temporal periods (years, months, weeks ... seconds), the Gregorian calendar, and the 24-hour clock. The lexical representations use [ iso8601 ] style notation, but ignoring leap seconds, which are explicitly mandated by the international standard. While this satisfies most web applications, many other calendars and temporal reference systems are used in particular cultural and scholarly contexts. For example, the Julian calendar was used throughout Europe until the 16th century, and is still used for computing key dates in some orthodox Christian communities. Lunisolar (e.g. Hebrew) and lunar (e.g. Islamic) calendars are currently in use in some communities, and many similar have been used historically. Ancient Chinese calendars as well as the French revolutionary calendar used 10-day weeks. In scientific and technical applications, Julian date counts the number of days since the beginning of 4713 BCE, and Loran-C, Unix and GPS time are based on seconds counted from a specified origin in 1958, 1970 and 1980, respectively, with GPS time represented using a pair of numbers for week number plus seconds into week. Archaeological and geological applications use chronometric scales based on years counted backwards from ‘the present’ (defined as 1950 for radiocarbon dating [ rc-14 ]), or using named periods associated with specified correlation markers ([ cr-05 ], [ cr-14 ], [ mf-13 ]). Dynastic calendars (counting years within eras defined by the reign of a monarch or dynasty) were used in many cultures. In order to support these more general applications, the representation of temporal position and duration must be flexible, and annotated with the temporal reference system in use. A set of ordered intervals (e.g. named dynasties, geological periods, geomagnetic reversals, tree rings) can make a simple form of temporal reference system that supports logical reasoning, known as an ordinal temporal reference system [ iso19108 ]. For many purposes it is convenient to make temporal calculations in terms of clock durations that exceed everyday units such as days, weeks, months and years, using a representation of temporal position in a temporal coordinate system [ iso19108 ], i.e. on a number line with a specified origin, such as Julian date, or Unix time. This may be converted to calendar units when necessary for human consumption. OWL 2 has two built-in datatypes relating to time: xsd:dateTime and xsd:dateTimeStamp [ owl2-syntax ]. Other XSD types such as xsd:date, xsd:gYear and xsd:gYearMonth [ xmlschema11-2 ] are also commonly used in OWL applications. These provide for a compact representation of time positions using the conventional Gregorian calendar and 24-hour clock, with timezone offset from UTC. Figure 3 Classes for temporal position. 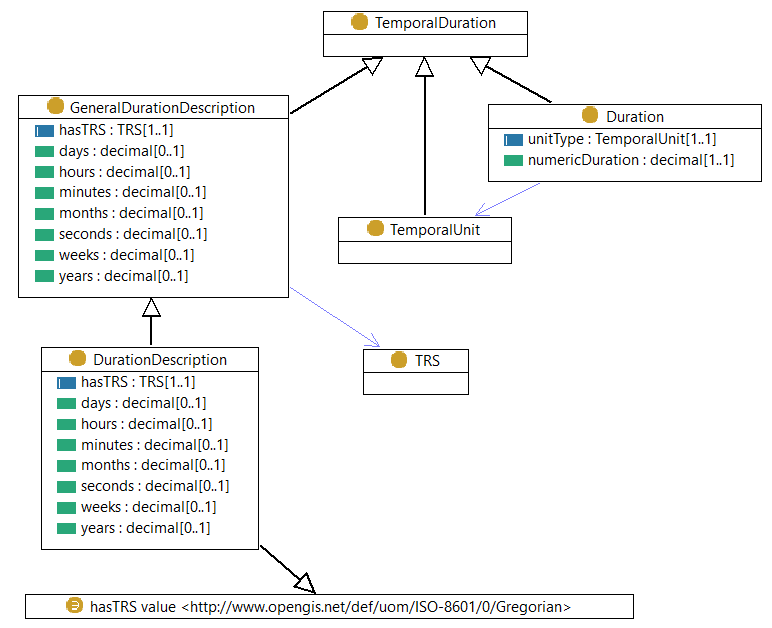 Figure 4 Classes for temporal duration. In this vocabulary specification, Manchester syntax [ owl2-manchester-syntax ] is used where the value of a field is not a simple term denoted by a URI or cURI. Six datatype properties :year, :month, :day, :hour, :minute, :second, together with :timeZone support the description of components of a temporal position in a calendar-clock system. These correspond with the 'seven property model' described in ISO 8601 [ iso8601 ] and XML Schema Definition Language Part 2: Datatypes [ xmlschema11-2 ], except that the calendar is not specified in advance, but is provided through the value of the :hasTRS property (defined above). 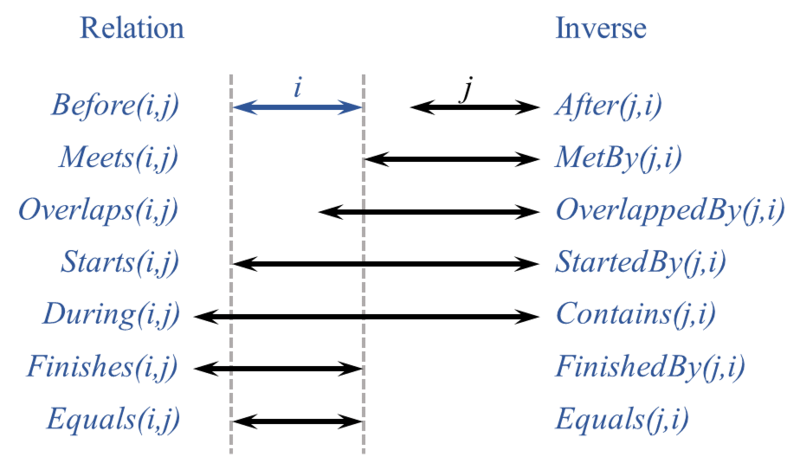 Fifteen properties :intervalBefore, :intervalAfter, :intervalMeets, :intervalMetBy, :intervalOverlaps, :intervalOverlappedBy, :intervalStarts, :intervalStartedBy, :intervalDuring, :intervalContains, :intervalFinishes, :intervalFinishedBy, :intervalEquals :intervalDisjoint :intervalIn support the set of interval relations defined by Allen [ al-84 ] and Allen and Ferguson [ af-97 ]. 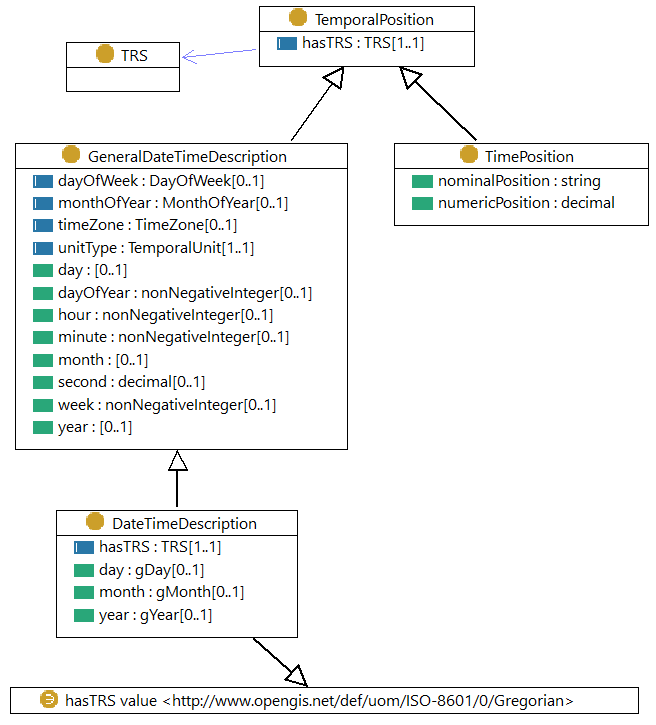 An ontology for time zone descriptions was described in [ owl-time-20060927 ] and provided as RDF in a separate namespace tzont:. 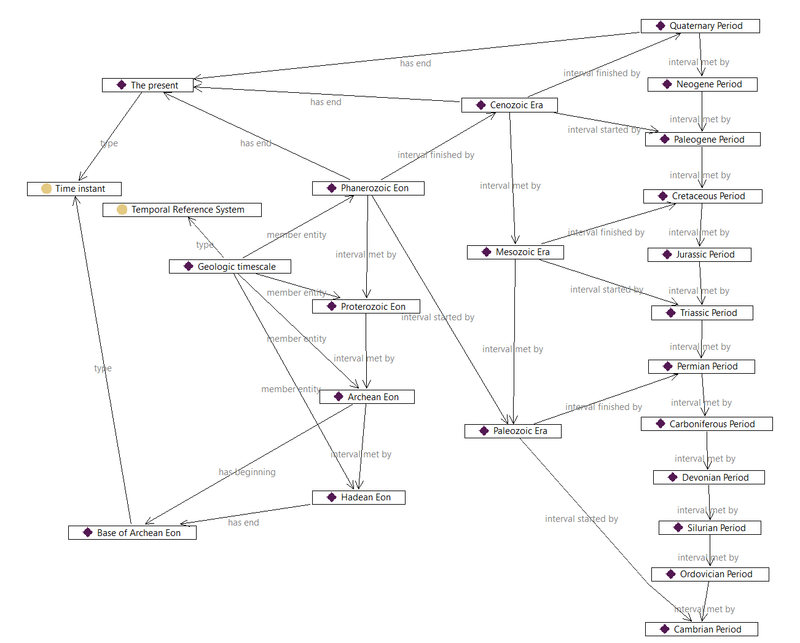 However, that ontology was incomplete in scope, and the example datasets were selective. Furthermore, since the use of a class from an external ontology as the range of an ObjectProperty in OWL-Time creates a dependency, reference to the time zone class has been replaced with the 'stub' class in the normative part of this version of OWL-Time. Detailed guidance about working with time zones is given in [ timezone ]. Definition: A temporal reference system, such as a temporal coordinate system (with an origin, direction, and scale), a calendar-clock combination, or a (possibly hierarchical) ordinal system. A taxonomy of temporal reference systems is provided in ISO 19108:2002 [ iso19108 ], including (a) calendar + clock systems; (b) temporal coordinate systems (i.e. numeric offset from an epoch); (c) temporal ordinal reference systems (i.e. ordered sequence of named intervals, not necessarily of equal duration). The geologic timescale is defined as a set of named intervals arranged in a hierarchy, such that there is only one subdivision of the intervals of each rank (e.g. 'Era') by a set of intervals of the next rank (in this case 'Period') [ cr-05 ]. Since the relative ordering is well-defined this graph can therefore serve as an ordinal temporal reference system. Fig. 5 shows how the geologic timescale can be expressed as a set of :ProperIntervals related to each other using only :intervalMetBy, :intervalStartedBy, :intervalFinishedBy. Many other interval relationships follow logically from the ones shown (for example 'Neogene Period' :intervalDuring 'Cenozoic Era') but the ones shown are sufficient to describe the full topology. Figure 5 Part of the geologic timescale formalized as ProperIntervals, with ordering relationships described using the predicates defined in this ontology. A number of requirements relating to Time were identified in the Spatial Data on the Web Use Cases & Requirements [ sdw-ucr ]. This section provides brief descriptions of how these requirements have been resolved.